Last week, the Associated Press’ Jeannine Aversa announced the top ten business stories of 2009, according to an AP survey of newspaper editors. My adverse reaction to Aversa’s description of 2009’s economy is similar to that of Dave’s dad: Rebound? REBOUND? Her assertion is objectively false. You haven’t “rebounded” until you’re back to where you were. Even if economic growth for the fourth quarter comes in at 4% as some predict, the economy won’t even be 40% of the way back from where we were before the recession as normal people define it (“a decline in GDP for two or more consecutive quarters”) began. More fundamentally, there’s the “little” matter of whether the recession is really over. As normally defined, the answer of course is simple, which is why we should prefer objective standards for these types of things. 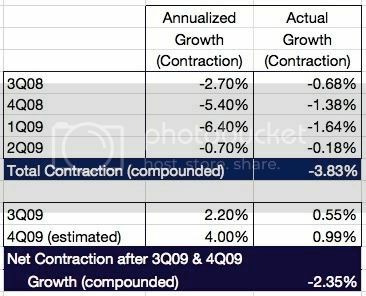 The third quarter’s positive annualized growth of 2.2% does indeed mean that the recession ended after four quarters of negative growth that began in July 2008. If she were fair, balanced, and consistent, Aversa would be waiting for an NBER determination before concluding that the recession is over. Do you think Jeannine’s shifting definition might have something to do with the fact that it helps Dear Leader?